Staats Long Morris took the British side, rising to the rank of General in the British Army, and commanding the 61st (South Gloucestershire) Regiment of Foot. He married a widow, Catharine Gordon, daughter of William Gordon, the second Earl of Aberdeen. 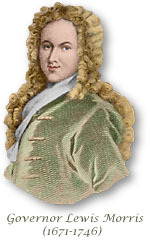 Although his wife had children with her first husband, Cosmo George, the third Duke of Gordon, Catharine and George had no children of their own.